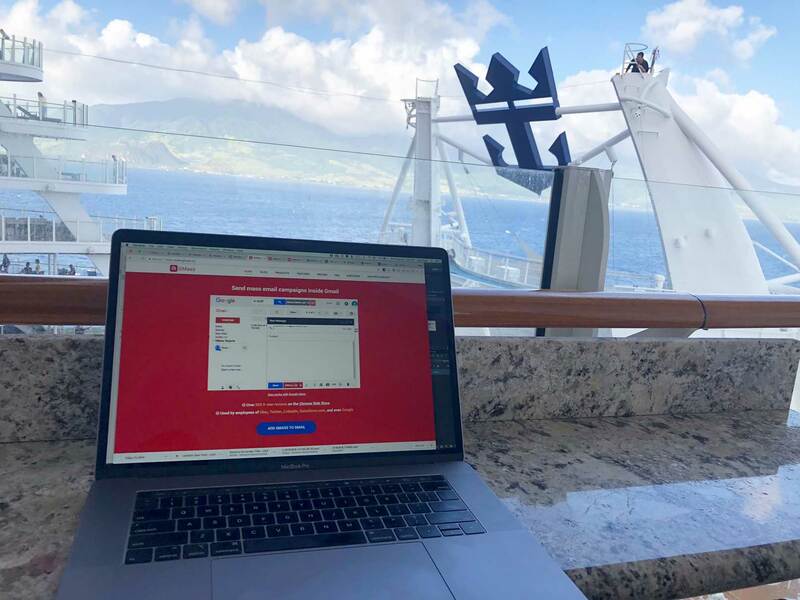 Is cruise ship WiFi fast enough for a sysadmin? Right now, my family and I are sailing on Royal Caribbean’s Harmony of the Seas, and because I’m always watching over GMass, we couldn’t have gone on this trip if it weren’t for the ship’s Voom Internet offering. Royal Caribbean’s WiFi offering claims to be the “fastest Internet at sea”. So, is it really the fastest? Royal Caribbean claims it’s 6x faster than any other Internet access offering on the sea, which is believable, but as a sysadmin, I’m only happy if it’s fast enough for me to manage my servers and deploy emergency bug fixes. 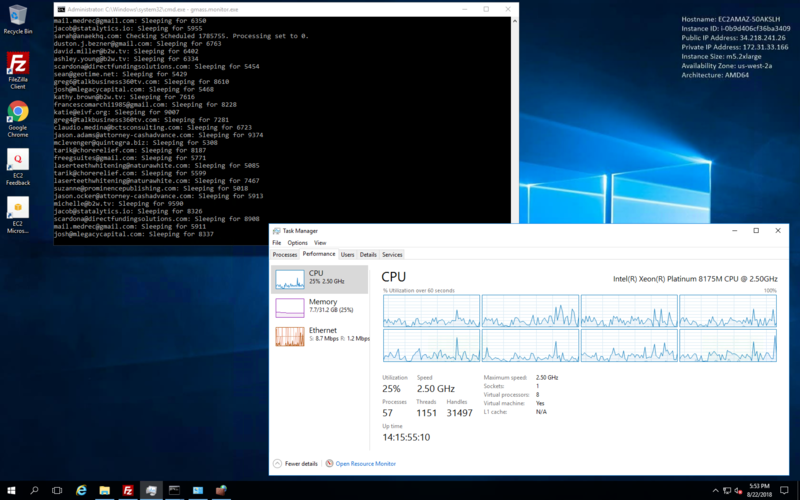 Let’s see just how fast it is, and if it’s fast enough for me, as a systems administrator, to be able to do my job and control the GMass network remotely. I’ve been running speed tests every day since boarding the ship four days ago, and the speed has been consistently around 2-4 Mbps downstream and about 1-2 Mbps upstream. Here’s one of the tests from speedtest.net. Now, other Royal Caribbean cruisers have reported different results. cruisecritic.com claims that Voom’s Internet at sea is “probably faster than most of us have at home”, which isn’t true at all, especially if you live in my home and are used to 200 Mbps downstream speeds. Cruzely.com’s assessment was more in line with my own, saying that streaming video is choppy at best, but basic functions like web and email access work just fine. By comparison, here is Carnival’s WiFi offering, which states that even on their Premium Wi-Fi Plan, video streaming services like Netflix, video calling services like Facetime, and WiFi calling are blocked, although an exception is apparently made for Skype. It’s even worse with Norwegian Cruise Lines, which outright states that NO video streaming services are allowed and that if you’re used to speedy Internet at home, expect slow Internet on the ship. In that sense, Royal Caribbean’s claim to have the best Internet access on the sea holds true. Neither Carnival nor Royal Caribbean actually come out and state what Internet speeds a user can expect, which is strange to say the least. I suppose they don’t want to be held accountable if speed falls short of what they promise. As a developer and sysadmin, my main concern is being able to transfer files and being able to remotely access servers via Windows RDP. Since Royal Caribbean actually offers two packages, a “surf” package which is limited to web and email access, and a “surf and stream” package which allows you to stream video and make video calls, I was concerned there might be some “port” blocking happening. Get it? “Port” blocking? 🙂 RDP runs on port 3389, surely a non-standard port for most cruise ship passengers, but much to my delight, it worked. I’m able to Remote Desktop into my server from the cruise ship. Now, although I found that port 3389 worked, that doesn’t mean that all ports are open. I was unable to FTP files to my server. Most sysadmins know that FTP uses a data channel on port 21 and a control channel on a port specified by the server at the time of the connection. My FTP is able to connect to the FTP server but not to the control channel to list any files or perform any functions related to files. I couldn’t FTP from the cruise ship. I’m thankful that Royal Caribbean has WiFi on their ships to begin with, because without it, we wouldn’t be able to cruise with them. The WiFi connection allows me to manage my servers, check my email, and monitor the GMass system. Transferring files was more difficult because of the FTP issues, but I’m able to work around that by using Amazon S3 as a file holding area. Overall, I’ve been able to be productive even when I’m supposed to be relaxing with my family on vacation. While Royal Caribbean’s claims about the speed may be exaggerated, the speed is still highly usable in many ways, including the ability to publish this very article!